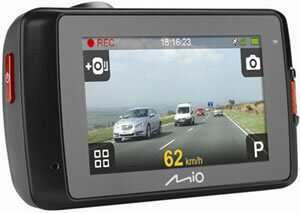 Mio MiVue 658 dash cam records in Extreme HD and has a 2.7-inch touchscreen. The viewing angle of the Mio MiVue is 140 degrees providing a wide view of the road ahead. Furthermore it has GPS technology for tracking your journey so, not only can you can playback video, you can also view your journey taken on Google Maps. You can buy the Mio MiVue 658 with or without WiFi connectivity for downloading videos to your smartphone. The MiVue 658 dashcam has a built-in G-Sensor for 'event recording.' When an impact or heavy-braking is detected the video will be saved to the Mio dash cam device so it cannot be overwritten. Additionally, parking mode uses motion detection to start recording when your vehicle is parked. Mio MiVue 658 Touch has been discontinued. The Mio MiVue 658 is a dash cam that records in Extreme HD Quality with a 2304 pixel camera making it better that 1080p HD quality. There is a 2.7 inch screen which is touchscreen for easy operation of this MiVue dash cam. Furthermore GPS tracking technology is also built in for recording your speed, altitude, longitude, latitude and heading. Speed camera alerts are also provided by the Mio MiVue 658 and the monthly speed camera updates are free for the lifetime of the dash cam. The dash cam features a F1.8 lens and it will record in low light conditions and provide brighter, clearer videos. There is a wide recording angle of 140 degrees capturing a wide view of the road ahead. Included in the box is a rotating mount that can easily be adjusted to capture events on the road. The Mio MiVue 658 is available either with or without WiFi. Both models can be bought at this webpage. The WiFi connectivity allows you to send video instantly to your smartphone or share videos on YouTube or Facebook using the MiVue app. Mio MiVue 658 includes a 3-Axis G-Sensor that detects motion to save videos which is a recording feature called 'event recording mode.' If you suddenly brake or there is an impact the MiVue 658 will detect this and save the recorded video Plus the dash cam also records the g-forces which you can view back along with the recorded video on your computer. Parking mode can be used on the Mio MiVue 658 dash cam to capture events that happen whilst your car is parked. 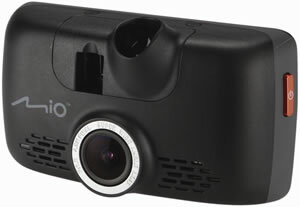 The Mio dash cam uses motion detection to start recording. Please note this requires a constant power supply or you can use the optional Smartbox which is sold separately. An additional feature on the MiVue 658 is photo mode. If you are involved in an accident then you can detach the Mio MiVue 658 from the car mount and take photos. 'Auto power on' is a feature of this MiVue dashcam. Simply start your car and the Mio dash cam will begin recording. MiVue Manager software is also included for playback of video on a computer. Full 1080p HD video quality can be viewed on your computer. Plus you can share videos on social media website such as YouTube and Facebook. The video is also syncronised with Google Maps so you can view your journey taken on a map. To make access of videos easier, videos are organised by type and date for fast searching of videos for playback. The 3-axis G-Sensor is also syncronised with the video playback on the computer. 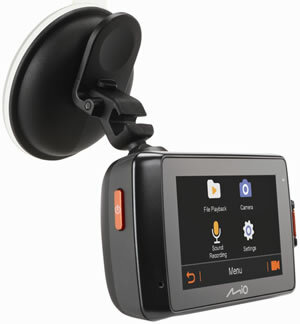 With the Mio MiVue 658 installed in your car you will get piece of mind when driving. You can drive assured that videos are being recorded of your journey and should an event or incident occur you will have video proof saved on your MiVue 658 dashcam. You will also be protected against fraudulent claims whereby the video recorded will prove who should be liable for any accident on the road. Built-in battery with 10-15 minute battery life designed for when using the dash cam in photo mode for documenting evidence of an incident or taking scenic photos. 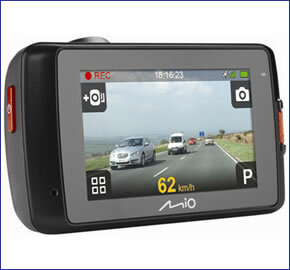 The Mio dashcam will support SD cards upto 128GB in size. Included in the box is a 32GB SD Card. A unique feature of the Mio MiVue 658 is that it has a speed camera database which is for the lifetime of the product so you will always know where the fixed and mobile speed cameras are. These speed camera alerts are provided by RoadPilot. Do you have a question about the MiVue 658 that's not been answered on this webpage? Please see our Dash Cam FAQ's for questions from other people. If the answer to your question isn't featured, use the online form to ask us for the answer. Alternatively please telephone 01733 777623 Monday to Friday (9:30am-5:00pm) to speak to one of our sales team. You can choose to locate the Mio MiVue 658 behind the rear view mirror, which also helps to ensure the highest quality recordings and does not obstruct your view of the road ahead. You will be using the included car charger to power the in car camera device. A windscreen mounting bracket is also provided. The battery built-in to the MiVue 658 has a battery life of 10-15 minutes and so it is not suitable to use when recording video. The battery is designed to be use when using the dash cam in photo mode. MiVue Manager is a tool for you to view the videos recorded on your MiVue 658 recorder on a PC computer or Mac Computer. The Mio MiVue software can be downloaded from the Mio Service website. The Mio MiVue 658 Touch includes free speed cameras and is compatible with both Mac and Windows computers. This is separate from the MiVue Manager software and is accessible via Mio's website. Looking for accessories and spares for the Mio MiVue 658 Touch and 658 WIFI Touch dash cams? Accessories available to purchase from ActiveGPS include a replacement vehicle power cable, hardwire power cable and USB cable.